What a beautiful weekend; meals alfresco, lots of family fun and glorious sunshine! It always goes a little too quickly though and here we are on Monday again, planning for the working week ahead... and it's July! I'm on a countdown until my holiday and also my brothers wedding in September so I'll be making extra effort to cut out junk, eat lots of fruit and veg and to exercise more frequently so I can shift a few pounds. 50 minutes of Zumba followed by a 20 min boxing/toning session is on the agenda this morning, Wednesday and Friday - I feel tired just writing about it! Sounds lovely have a great week! Im never one for planning although I know I should. We just cook what there is which means I never stick to my shopping budget. Would this be something you may go into more detail on you blog? 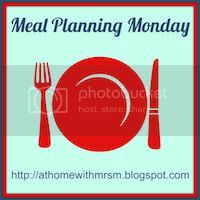 Meal planning is something I seriously need to do to help stick to our ever tightening budget! We had cod in cheese and parsley sauce with jacket potatoes and vegetables at the weekend - one of our favourites!